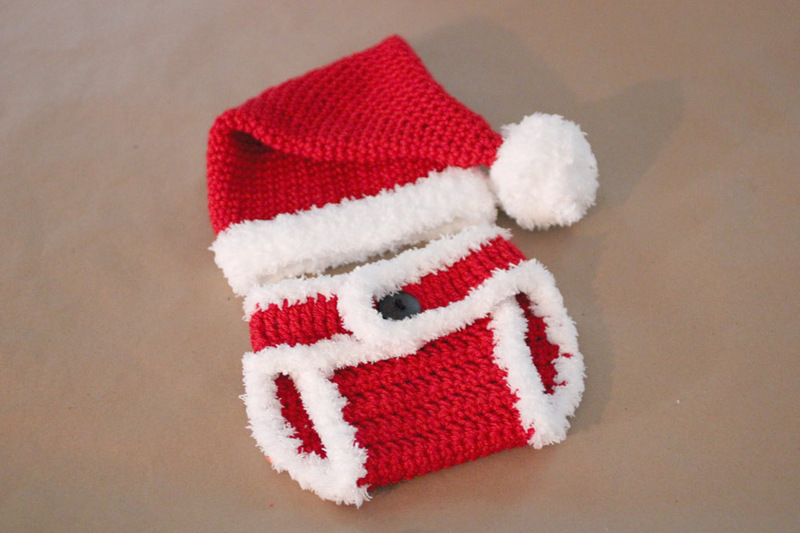 Even though this isn’t my own pattern, I just had to share this adorable crochet Santa hat and matching diaper cover I made as a custom order this week! 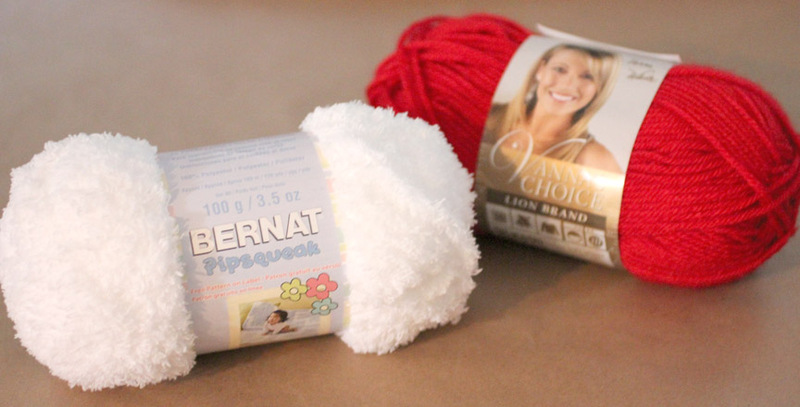 The Bernat yarn is absolutely PERFECT for the white parts and I love how it is ultra soft. It would make a great gift and a cozy hat for little Christmas baby. 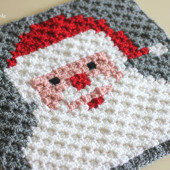 I followed the Crochet Santa Hat Pattern from Girl In Air. She provides a pattern for newborn – adult sizes! The only thing you have to figure out is how long to make the hat since she doesn’t provide a total number of rounds. For the newborn hat (pictured), I made approx 40 rounds in red and 5 rounds in white. You want to make sure you leave a long part on the top so it flops over when being worn. The Free Diaper Cover Pattern is from Crochet A Flowers. I followed the directions exactly, using red for the diaper cover and the white Bernat yarn around the edges. Finishing it with a black button in the middle. 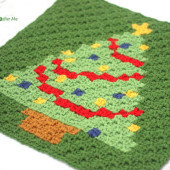 It’s not too early to start crocheting for the holidays! This would make a great gift for all ages! This is too stinkin cute! Thanks for sharing! Oh I love it!! I have never made a diaper cover are they hard? Very cute, might have to look at this for a baby due just before xmas. What would you charge to make one for me? Im a photographer and would love to use this in my pictures!! Amy, could you send me an e-mail at [email protected] with a link to your website/business page? We can work something out 🙂 Thanks! this doesnt offer the pattern for the hat anymore,,would you have it please? Hi there are you selling these? I would like to buy one , for A newborn size! 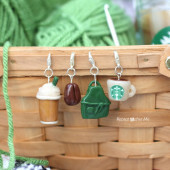 We’re you able to find someone to make this for you? Let me know. I can make it for you. Hi these are adorable for a Christmas Baby Shower – pinned them to my Christmas Baby Shower theme!!! When you made these, did you use the same size hook for both? So adorable! Can't take my eyes of these cuties! You are so very, very talented! Do you think I could use the Bernat for the whole cover? I was thinking that would be darling for your upcoming bunny set, but not sure if it would be "substantial" enough. Thanks so much, and love all your work! Sarah, is the pompom on top an actual pom pom? it doesn't look like there are loose ends. So cute I had to make it! Thanks for posting. Any tips for trimming the Pom Pom? Mine is huge and the yarn is so hard to cut. I've tried two different pairs of scissors. What row did you start doing the 40 rows from? I was thinking from the 15-16th row start counting forty? I made 3 of these diaper covers to match with owl hats…loved the pattern but all of mine were 3-4 rows too short so when it was buttoned it pulled down and just didnt look like it fir. Easy enough to adjust, wondering if anyone else ran into this problem? So how do I get this pattern? So frustrated with this pattern. There are errors with stitches and even after adjusting my tension I just cannot get it to look like an actual santa hat. It looks like a funnel. Link for Santa Hat from ‘girl in air’ isn’t working. Have tried several times over several days and get same response. 🙁 Love ur site and all the goodies u offer here so I wanted u to know this link won’t open. Are you selling these? If so, how much? My son will be 4. Months old at Christmas time and I would love to use this for Christmas cards! Did you get the pattern for the hat? It’s not working for me either. I cannot get the pattern from the girl in air website. Can you email it to me? The hat link is no longer available. Is there any way you can tell us how to make it? Also, I finished up the diaper cover but it doesn’t look big enough to fit 0-9 months, but more like 0-3 months. Does that sound right! Thanks & hope you will reply to this! 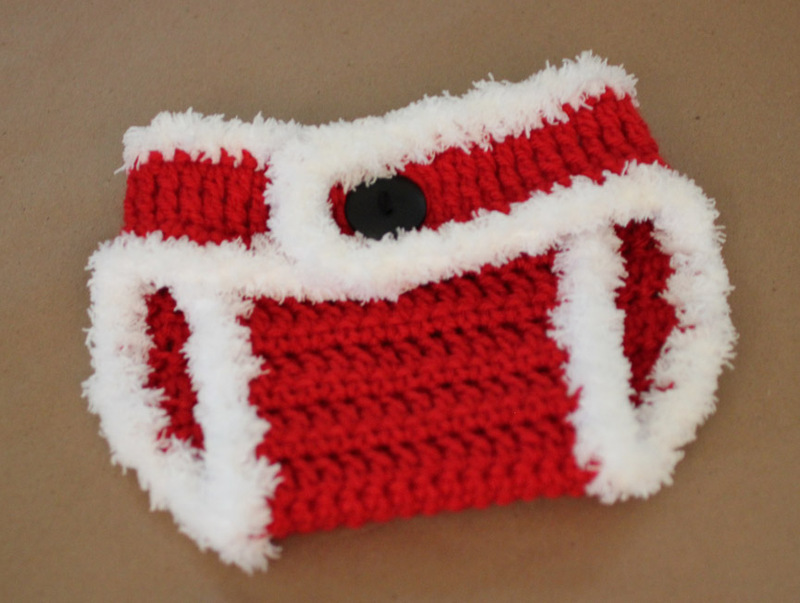 I love this Santa hat and diaper cover, but I am unable to get the patterns from your links. Is there any way you could send the patterns to me or send me different links? 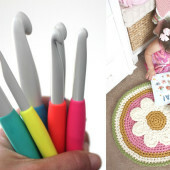 I am so excited to make this for my new great nieces. Sarah, I came across your site a few years ago when I first got a Kindle. I LOVE !!!! Been crocheting for 40+ years and have a very creative mind too. Mom wanted to fund a crochet/Craft shop for me, way before the internet! Too much of a risk, but you are a great craftsperson! Your photos and directions are beautiful! I’ve only actually made a few hats, Rudolph and Polar Bear. My 2 nieces(5 yrs & 15 mos.) love them! The Rudolph Hat is a big hit with everyone who sees it! Our other niece , quite a bit older(34) is expecting her first baby in December and I’ve been busy crocheting for her shower. 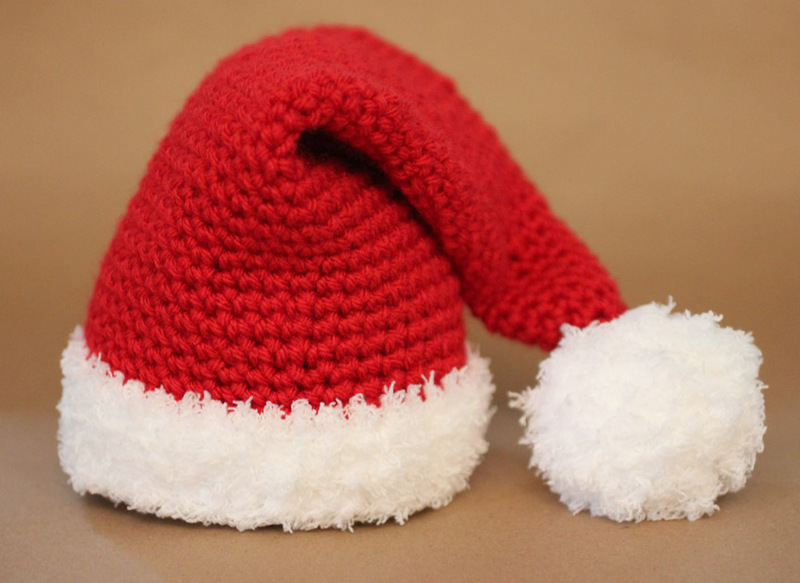 Is there any wayyou could post a pattern for the Santa Hat that goes with the Diaper Cover? Like others in comments, I’ve tried the link but it’s been deleted or something. Even a general idea of decreasing and number of rows would be helpful and appreciated. Thanks for all you do and your inspiration! For those that found the link broken, someone shared the pattern that was linked originally. It is this one–> http://girlinair.blogspot.com/2010/12/how-to-make-santa-hat.html?m=1 They said that there was a miscalculation on her stitch counts at some point, but the comments seem helpful enough. You also add more rows of the white to get the effect of the band. Hope that helps!! For the diaper cover. Rows 6-9 says “repeat rows 4&5 twice”. Does this mean this section will have 16 rows? The link for the Santa hat doesn’t work, does anyone have the directions? Hello, I’m about to be a grandma anytime now & would love to make this for my grandbaby. Would you be so kind to send me the pattern. Can’t seem to pull it up from the web. Thank you!!!! !